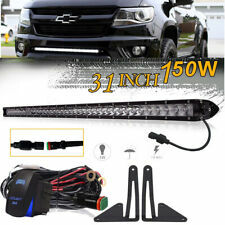 17Inch 80W Single Row LED Work Light Bar Spot Flood Combo Beam UTE Truck 15" 16"
Size:2015-2018 Chevrolet Colorado 4WD/2WD GMC Canyon 4WD/2WD bracket and light bar. Interchange Part NumberFor 15-18 GMC Canyon Chevy Colorado. 2015-2018 Chevrolet Colorado 4WD/2WD GMC Canyon 4WD/2WD. Beam Pattern: Flood Spot Combo Beam. Spot & Flood Combo Beam. LED Power: 144W (48 x 3W High Intensity LED). Super bright view area, see clearly at night, excellent visual effect,it is fit for fishing. Flood BEAM: Our Flood optic projects light over great distances in a concentrated beam. Beam Type: Flood Beam. LED POWER: 18W with LED, 1620LM, 10-30V DC, 50000 hours working life. 50% brighter than normal one. Our main products are Led light bar, CREE Work Light, Round head light, etc. LED power: 162 W. Light Color: White. Q:What should I do if Ididn't receive my item?. Material: Diecast aluminum housing. Plug Type: 9006,single beam. 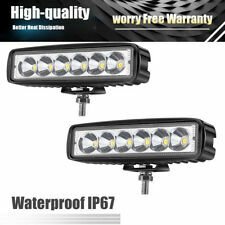 (2pcs/set)9006 CREE LED headlight conversion kit. Color Temperature: Pure White 6500K Amber Yellow 3000K. 2 x 9006 LED headlight bulb. IP68 rated water and dust seal,360 degree beam angle. 2x 9005 HB3 LED bulbs Headlight Screwdriver 2 Ribbons User Manual. TURBO SII D6 Series Super Bright High Low Beam LED Headlight Bulb Conversion Kit. Beam Pattern:9005 High Beam. 360 Degree Adjustable Beam Angle 6000K White Light Source. 2x 9006 HB4 LED bulbs Headlight Screwdriver 2 Ribbons User Manual. TURBO SII D6 Series Super Bright High Low Beam LED Headlight Bulb Conversion Kit. Beam Pattern:9006 Low Beam. 360 Degree Adjustable Beam Angle 6000K White Light Source. The mounting brackets and screws from us are made from 304 stainless steel. 2015-2018 Chevrolet Colorado 4WD/2WD GMC Canyon 4WD/2WD. Brackets Material: Iron Alloy. 2 x Mounting Brackets. We have professional Optical Engineer to ensure every kind of light bar will never has astigmatism. Power: 360W. Apply to: Pickup, Wagon, UTB, Cab, ATV, SUV, Jeep, Truck, Boat, Bus. Mounting Accessories. 2pcs 2x36W pods. Specialized Vehicles: fire engine, police car, rescue vehicle, communication vehicle, military command vehicle etc. 2x H8 H9 H11 bulbs Headlight Screwdriver 2 Ribbons User Manual. TURBO SII D6 Series Super Bright High Low Beam LED Headlight Bulb Conversion Kit. DOT Approval-Designed to Conform DOT FMVSS-108. LED power: 150W(30pcs 5W high intensity LEDS). 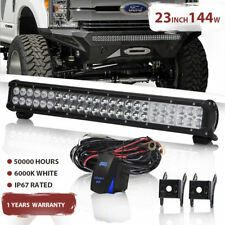 1 x 30in 150w led light bar. The mounting brackets and screws from us are made from 304 stainless steel. 2015-2018 Chevrolet Colorado 4WD/2WD GMC Canyon 4WD/2WD. LED power: 150W(30pcs 5W high intensity LEDS). 1 x 30in 150w led light bar. Material: 6063 Diecast aluminum profile, stainless steel bracket, PC Lens. We have professional Optical Engineer to ensure every kind of light bar will never has astigmatism. Flush Mount. 2 18W Flush Mount LED Lights. Beam Pattern: spot beam. LED power: 18W LED. No glare to ensure the safety of the driver on the opposite side, lightness is mild, lamp life is long, and there will be no fading in 1 year. Power: 960W---(96000lm). Led Light Bar. Led Work Light. Led Headlight. Led Headlight Bulb. Beam Angle: spot beam(30 degree) & flood beam(60 degree) combo. Side brackets raise the light bar height,improve air flow for better heat elimination. Fit For:2015-2018 Chevrolet Colorado 4WD/2WD GMC Canyon 4WD/2WD. Brackets Material: Iron Alloy. 2 x Mounting Brackets. 1 x 30in 150w led light bar. LED power: 150W(30pcs 5W high intensity LEDS). LED color temperature: 6000K. • Power: 162W(54pcs x 3W). 1 X 162W Work Light. • Beam pattern :Flood Spot Combo Beam. Our goal is to make your choice easier and save your money. IP Rate: IP65 DOT. Color Temperature: 6500K White. Beam Angle: 360°. To Fit: Low Beam Head Lights KIt. Application: Low Beam Head Lights. Beam Angel: 360 Degrees. Low Power Consumption than Halogen bulb, Energy Saving. The mounting brackets and screws from us are made from 304 stainless steel. 2x front lower hidden bumper mounting brackets for Chevrolet Colorado/GMC Canyon. Beam Type: Flood & Spot Combo Beam. Mounting Bracket: Stainless Mounting Hardware. The appearance of fine craft and easy to install brackets. Apply to: Pickup, Wagon, UTB, Cab, ATV, SUV, Jeep, Truck, Boat, Bus. Beam Angle:Combo (12 Flood 76 Spot 12 Flood). LED Color:White (6000 K). 2x 9005 HB3 LED bulbs Headlight Screwdriver 2 Ribbons User Manual. TURBO SII D6 Series Super Bright High Low Beam LED Headlight Bulb Conversion Kit. DOT Approval-Designed to Conform DOT FMVSS-108. Beam type: flood spot combo beam. We have professional Optical Engineer to ensure every kind of light bar will never has astigmatism. 1 x 30in 150w led light bar. LED power: 150W(30pcs 5W high intensity LEDS). 2015-2018 Chevrolet Colorado 4WD/2WD GMC Canyon 4WD/2WD. Material: 6063 Diecast aluminum profile, stainless steel bracket, PC Lens. We have professional Optical Engineer to ensure every kind of light bar will never has astigmatism. Dodge W250 1981, 1 982, 1983, 1984, 1985, 1986, 1987, 1988, 1989, 1990, 1991, 1992, 1993. Dodge W150 1981, 1982, 1983, 1984, 1985, 1986, 1987, 1988, 1989, 1990, 1991, 1992, 1993. Dodge W350 1981, 1 982, 1983, 1984, 1985, 1986, 1987, 1988, 1989, 1990, 1991, 1992, 1993. 2x 4" 18W Pods Cube Spot LED work lights. Apply to: Pickup、Wagon、UTB、Cab、ATV、SUV、Jeep、Truck、Boat、Bus. The universal mounting brackets and light bar fit all the vehicle. Color Temperature: Pure White 6000K. LED Power: 144W (48 x 3W High Intensity LED). Beam Pattern: Flood Spot Combo Beam. Round LED Work Light. Square LED Work Light. Straight Light Bar. Curved Light Bar. LED Headlight. Car LED Headlight. TURBO SII D6 Series Super Bright High Low Beam LED Headlight Bulb Conversion Kit. Xenon working temperature up to 800 degree -1000 degee, the main reason for the car ignition. 2x9005 HB3 Bulbs Headlight Screwdriver 2 Ribbons User Manual. Power: 80W. Proper Spot & flood beam combo spreads optimal light pattern without dark zone or foggy light. 1x80W Single-Row LED Work Light Bar. Rather than traditional conical beam,oval-shape reflector creates an oblong beam that maintains a bright center punch light,as well as incredible horizontal dispersion. Socket type: 9006 (HB4). One Pair 9006 LED Bulbs White/Amber Color (2 bulbs). 360 degree adjustable beam angle design. Beam Angle: 360 degree. LED type: COB. Color: Super White.